After years of planning and politicking, the selection of the location of the 2024 Summer Olympics is turning out to be between two large global cities. Several candidate cities expressed interest in hosting the 2024 Olympics including Rome (Italy), Nairobi (Kenya), Casablanca (Morocco), Durban (South Africa), Johannesburg (South Africa), Doha (Qatar), Brisbane (Australia), Paris (France), Berlin (Germany), Hamburg (Germany), Copenhagen (Denmark), Saint Petersburg (Russia), Kiev (Ukraine), Budapest (Hungary), Istanbul (Turkey), Baku (Azerbaijan), and Los Angeles (USA). As the bids were announced, city by city fell by the wayside, leaving the lead pack of Rome, Paris, Budapest, and Los Angeles. But Rome and Budapest pulled out, leaving only Paris and Los Angeles as the two possibilities to host the world's Olympic athletes and the 2024 Olympic 10K Marathon Swim. * 1904 St. Louis Olympics (Games of the III Olympiad): Man-made pond near Skinker and Wydown Boulevards in St. Louis, Missouri, U.S.A. 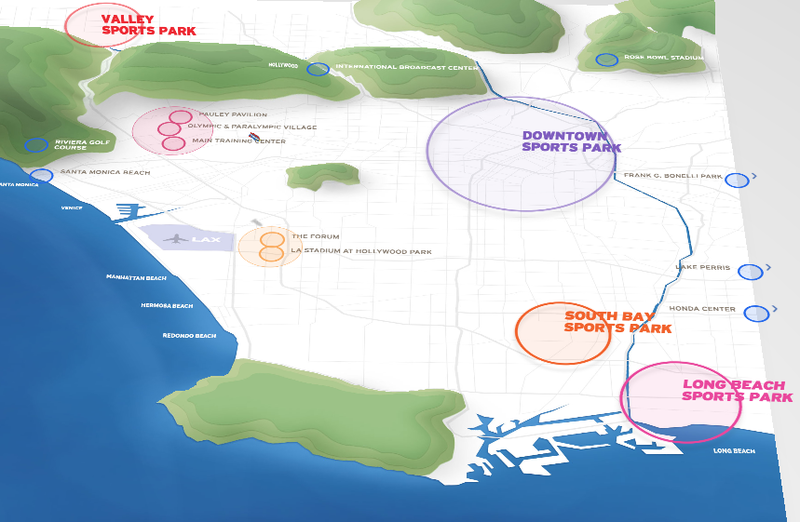 Ultimately, Long Beach was selected and if Los Angeles gets the bid, the Olympic 10K Marathon Swim will be held along the Long Beach waterfront at the Long Beach Sports Park [see map above and here]. France or America, the River Seine or Long Beach...where will the 2024 Summer Olympic Games be held? Stay tuned to find out from the IOC this September.